The recent report of a fossil bird discovered in Wyoming shows another glaring indicator of evolution’s failure to explain the story of life. Scientists analyzed the fossil and realized it’s related to the turaco, a living bird that’s only found in Africa.1 The Paleocene bird fossil is supposedly 55 million years old, but this coincides with a time when, according to evolutionary timelines, North America and Africa were thousands of miles apart—much as they are positioned today. If evolution were true, we should only find turaco-like bird fossils in Africa, not some distant land like western North America. The secular authors of the recent fossil bird paper openly acknowledge the evolutionary contradictions in their research field and state, “Many avian crown clades [living representatives of a group] with restricted extant distributions appear to have stem-group relatives [ancestral types] in very different parts of the world.”1 In light of evolution, these finds make no sense at all. It’s common to find contradictions between evolution and the field of biogeography. The lack of support that the fossil record and biogeography demonstrate for evolution was a key reason Bechly eventually abandoned his support for macroevolution and became a strong proponent of intelligent design and special creation. It may seem odd that fossils of turaco-like birds are found in North America while the living versions of these same birds are only found in Africa. 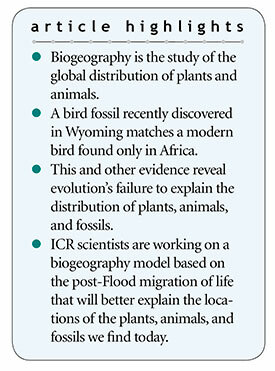 But in ICR’s global Flood model, the bird fossils were deposited during the receding phase of the Flood as part of the Tejas Megasequence. The modern descendants of the turaco birds merely migrated from the Ark to Africa after the Flood. We would not expect all animals to return to their same pre-Flood locations anyway since thousands of miles of water now separate the landmasses. Many groups of animals, birds, and plants first appear as fossils in Tejas Flood layers, largely representing pre-Flood ecological zones at higher non-coastal elevations. While some creationists have tried to place the post-Flood boundary at the end of the Cretaceous period, their ideas are not well-supported by either the global geological or the paleontological evidence. To help build a global model of biogeography in the context of the Genesis Flood, ICR scientists are engaged in a research project that will utilize recent and past paleontological research, along with large-scale mining of paleobiology databases. One especially useful technique involves globally mapping fossil occurrences and comparing their relationship to results from the ongoing geological megasequence mapping in the ICR Column Project. Belief in the Genesis global Flood—and distribution of life afterward—will help us construct a more accurate model of Earth history. Not only do new discoveries like this Wyoming fossil bird debunk evolution, they also provide an excellent opportunity for creationists to offer better, Bible-based explanations for the distribution of the plants, animals, and fossils we see today. Belief in the Genesis global Flood—and the distribution of life afterward—will help us construct a more accurate model of Earth history. Field, D. J. and A. Y. Hsiang. 2018. A North American stem turaco, and the complex biogeographic history of modern birds. BMC Evolutionary Biology. 18: 102. Bechly, G. Rafting Stormy Waters: When Biogeography Contradicts Common Ancestry. Evolution News & Science Today. Posted on evolutionnews.org June 27, 2018, accessed July 3, 2018. Cite this article: Various Authors. 2018. Building a Biblical Paleo-Biogeography Model. Acts & Facts. 47 (9).